The Dusty Diner needs music! 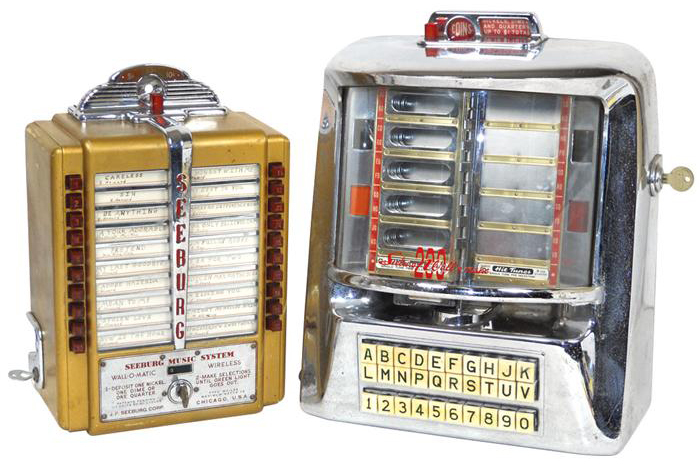 Diners of the 1950s had juke boxes filled with single-play records. “Wallboxes” on the tables of each booth let you play any of the songs by inserting a coin into a wallbox and pressing a pair of buttons corresponding to the song that you wanted to hear. I’ve called the Dusty Diner’s version of a wallbox a Juke-O-Matic. This foot-high painted wooden box has a shiny metal panel. It lists 64 songs from the 1950s and early 1960s on a piece of paper visible in a back-lit window. Do you want to hear “Mr. Sandman” by The Chordettes? The list shows that’s code “B6”. Press the B button and then the 6 button, and you’ll hear Janet, Carol, Lynn, and Margie harmonize their Billboard #1 from 1954. Since Burning Man allows no commerce, no coin is needed. All plays are free! 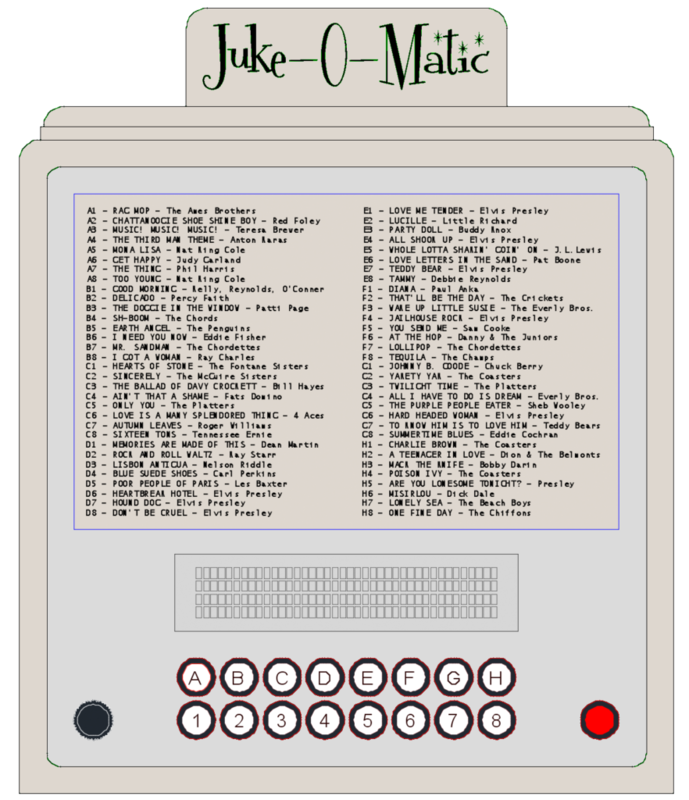 The Juke-O-Matic lets you put up to four songs in a playlist. The OLED screen above the buttons shows the song that is currently playing and the remaining songs in the queue. If you want to stop the current song and skip to the next, press and hold the red “eject” button. The Juke-O-Matic will be mounted on the Dusty Diner’s table for easy access. The Juke-O-Matic’s enclosure is inspired by Seeburg wallboxes like the 20-play model W1-L56 and the 200-play model 3WA, shown below. The Juke-O-Matic takes the painted finish and the static song display from the W1-L56, but to let it play more than just 20 songs, it adopts the letter/digit control of later models like the 3WA. Overall, the enclosure will be made from a paint-grade wood like poplar, and the front panel will be milled from 1/8″ aluminum sheet. The free font used for the name of the Juke-O-Matic is called Fontdinerdotcom Sparkly. Seeburg wallboxes: model W1-L56 and model 3WA. The Juke-O-Matic will be powered by a DC/DC Converter. The converter’s input is 36 volts from the main battery, and its output is 9 volts needed by the Arduino. Since the Arduino can be powered by 12 volts, an open question is whether the DC/DC Converter will be dedicated to the Juke-O-Matic or will be shared with other parts of the Dusty Diner that need 12 volts. I’ve selected songs from the 1950s that I like and that I think will be enjoyed by others at Burning Man. Here is the current list. The songs are in chronological order by the dates that they acheived fame (the date of the song’s top Billboard rank or the date of its broadcast exposure, or lacking those, the date of its release). A2 - THE THIRD MAN THEME - Anton Karas              E2 - WAKE UP LITTLE SUSIE - The Everly Bros.
B5 - AIN'T THAT A SHAME - Fats Domino               F5 - ALL I HAVE TO DO IS DREAM - Everly Bros.
A few early 1960s songs are included. If I choose more 1950s songs, the 1960s songs will be pushed off of the list. Updated December 18, 2017: After reviewing an archive of Billboard Top 100 lists, I added a few songs and removed a few others. The number of songs remained the same.